Senegal, a West African nation on the Atlantic Ocean, was home to Africa's greatest movie-maker, Ousmane Sembene. Today, Moussa Toure follows in the master's footsteps with this drama of 30 men (and one woman, a stowaway) who set out on an illegal 7-day voyage to Spain - making the perilous trip in a pirogue - a boat resembling a vastly oversized dinghy. While sharing a common desire to build a better future, these men hail from different ethnic and religious backgrounds. The story grows from a finely delineated mosaic of personalities - reactions to the mounting danger of the journey that span the emotional panoply of human experience. Toure's compelling tale says as much about the universal nature of courage and perfidy as it does about the economic realities faced by so many of the world's people. 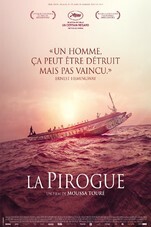 THE PIROGUE was featured in Cannes 2012, in the Un Certain Regard section.